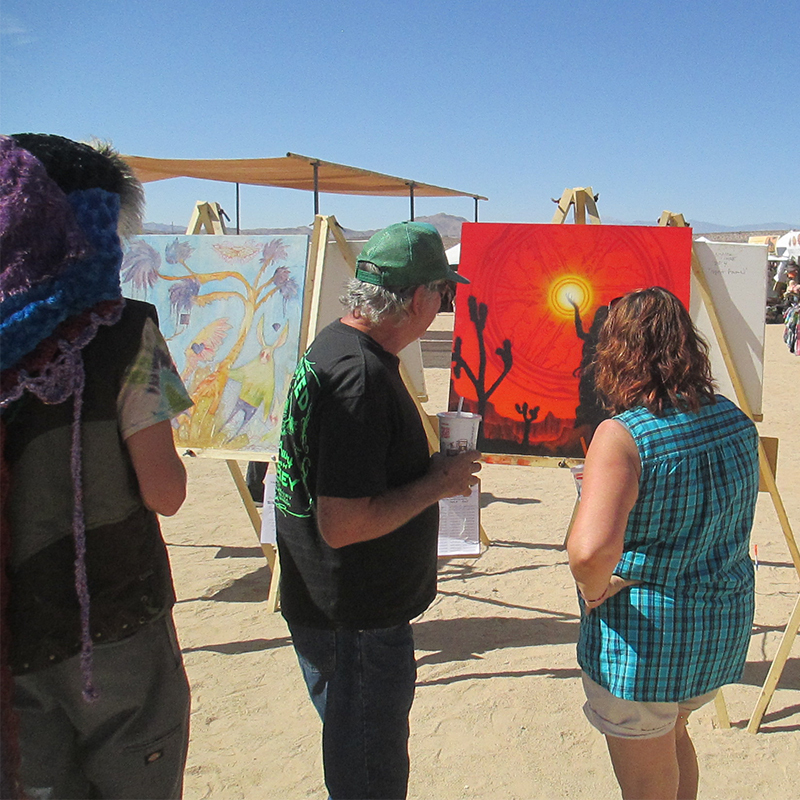 It was a real pleasure to be among almost 20 painters featured at the Fall 2014 Joshua Tree Music Festival, in Joshua Tree, California, USA. 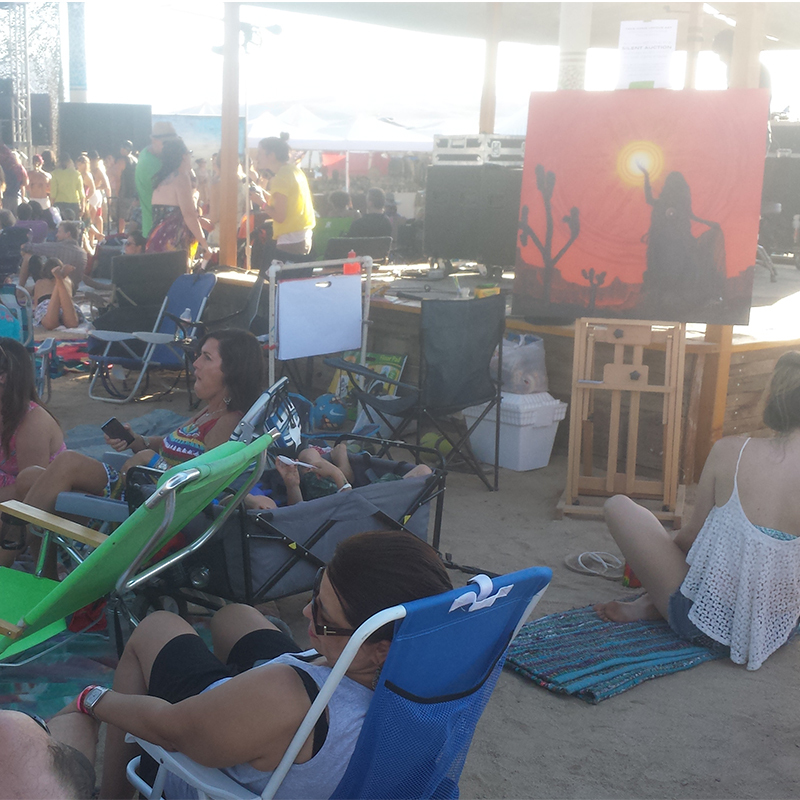 I spent the first three days of the festival working on a piece that was eventually sold as part of a fundraising auction. It was a real honor to have my work actively bid on and among the paintings that had a lot of interest. 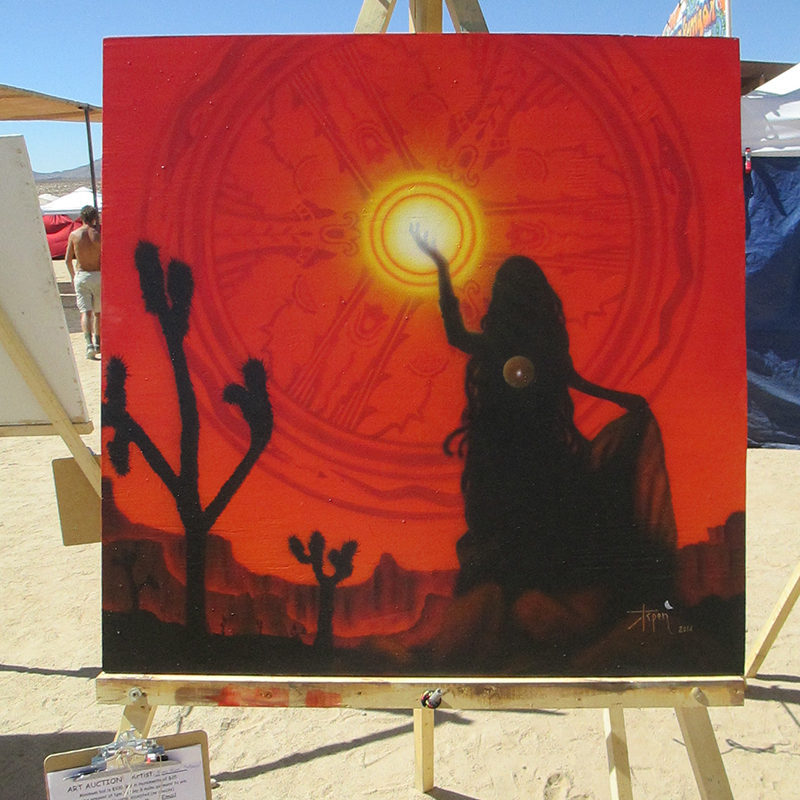 I created a piece I entitled The Source, which featured the local desert landscape and colors, and a silhouette of a young woman connecting with the Sun—our source. The sun features a mandala of patterns from pottery art of the Tesuque Tribe of the New Mexico desert basin and depicts corn, flowers, rain, and baskets of the abundance from the Earth, which are fruits our sunstar provides. A tiny starlight emanates from the woman’s heart, representing our deep connection to Source. One of the real challenges I faced was trying to get a painting to a somewhat finished state in only two days… When you understand that most of my gallery pieces took between 75 and 150 hours to create, often spread over many months’ time, you can understand how working in such a tight schedule could be tricky. It had to be signed and finished at the end of the second night of the festival, so that the auction could happen early Sunday morning. Luckily I was a experienced project manager in a former life and I’m pretty good at planning and scheduling when I need to be. But it meant I had to leave out a lot of detail and precision I would have loved to fuss over for hours and hours. Nevertheless, in the end, I had something I really liked. Painted in about 20 hours total time. I was impressed with the fact that the auction raised several thousand dollars for a children’s music program in the Joshua Tree community. 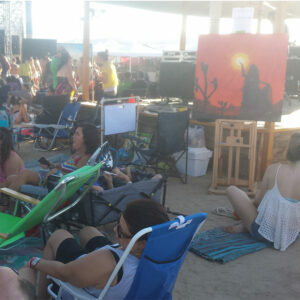 This, despite the fact that it was the first year the live painting and silent auction was part of the Joshua Tree Music Festival. It was an inspiring collaboration of organizers, artists, and patrons. 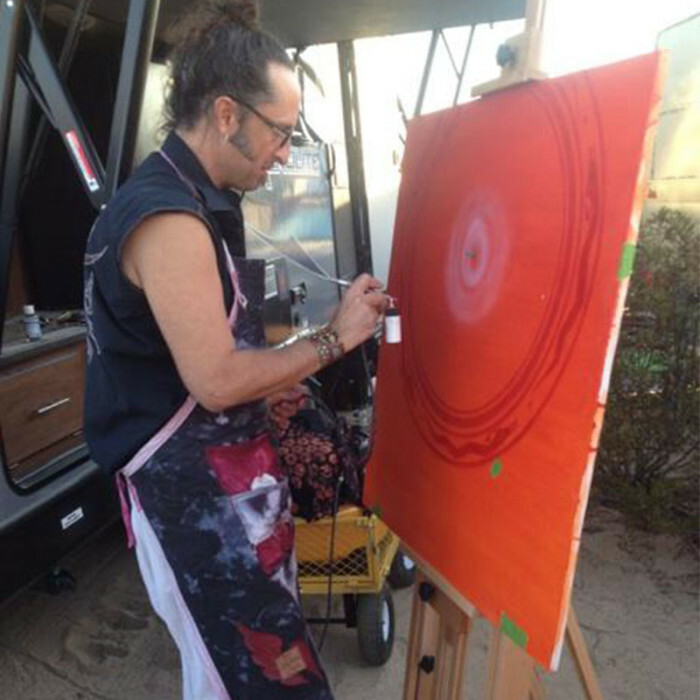 Here are a few images of the process of creating The Source. Hello, it was an honor meeting you at the Joshua Tree Music Festival. Are you going to be painting another picture like this one? I would be highly interested, if so. Hi Brenda. It was great to meet you too! I’m not sure what the future holds… It’s likely I’ll be there at the May 2015 Joshua Tree festival and I may do something in the same style. Hopefully something I make in the future speaks to you in the same way at least. I’ll keep making art! -am. Aspen, this piece is glorious! Well done, great to see you break out of your rhythm and show up to expand your repertoire. 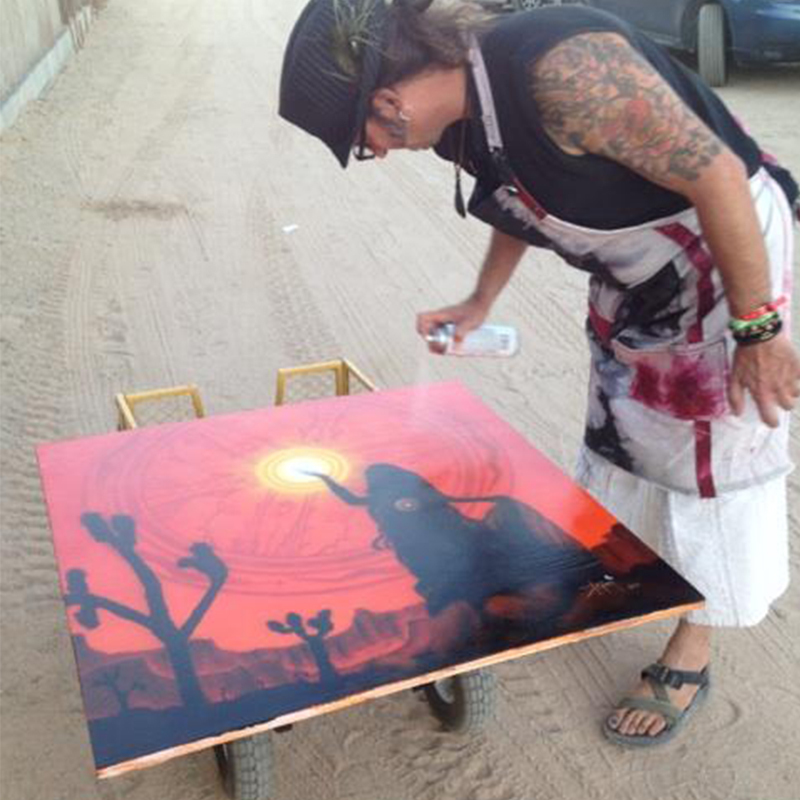 It is such a passionate depiction of the desert and the woman. I love it!